Cradle of Filth are an English “Black Metal” band that use lyrical content and imagery which is very heavily influenced by Gothic literature, poetry and vampire lore. While viewed by casual observers as “satanic”, fans of the band are aware that Cradles themes and image are based on shock value rather than any actual religious beliefs they may have. Cruelty and the Beast is their third album, and second on the label Music for Nations but after their second album, Dusk and her Embrace received wide acclaim, just how do a band like this follow up? For this album, the band consisted of Dani Filth, as founding member and vocalist, with Stuart Anstis and Gian Pyres on guitars, Robin Graves on bass, Lecter on keyboards and Nicholas Barker on the drums. Female vocals were provided by Sarah Jezebel Deva and Danielle Cneajna Cottington with guest parts by Ingrid Pitt. 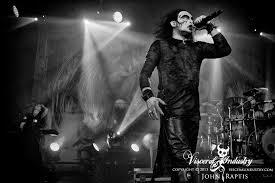 As a band in 2014 though, only Dani Filth remains and there have been 21 other members (including a few who quit and returned multiple times) in the band between their debut and now. 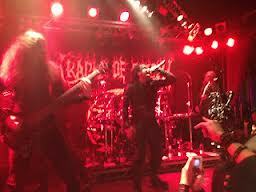 Cradle of Filth is very much Dani Filths band, lyrics, music and imaginings. Cradle doesn’t exist without Dani but can exist without the other members of the band. 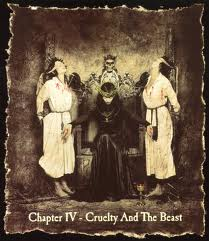 Cruelty and the Beast was released in May 1998 and is a concept album based on the legend of the Hungarian “blood countess”, Elizabeth Báthory. The album features guest narration on certain passages by Ingrid Pitt in-character as Báthory, a role she first played in the Hammer film Countess Dracula in 1971. It features 10 tracks in total coming in at just under an hour in total length so is pretty long but quite typical of Cradle and the genre. The album starts off with Once upon Atrocity which is very much just a mood setter. It is an “instrumental” of sorts but is really just under two minutes of Gothic gloom with increasing volume of organs and moaning which leads straight into the second track. Thirteen Autumns and a Widow starts off with a waving effect interrupted by drums and guitars which builds up to one of Dani’s deeper screams. The lyrics are screeched at pace and while the drums lack any real depth, the guitars play some clever leads over the top of the Gothic effects. At around 2 and a half minutes in, the pace changes to a rhythmic drumming over guitar and a deep growled chant style of singing which sounds brilliant. This leads into some female lyrics and then back to the original pacey structure, a pattern that continues throughout until near the end when it switches the pace down to a slower, vicious sound that sees the song to a close. A great start to the album. Cruelty Brought Thee Orchids is next and starts with a short spoken quote that, as soon as it ends, explodes into life with real pace, but again no real depth to the drums and a non-existent bass, that builds up to an ear splitting shriek. The first verse pulls you along at pace before a sudden stop and you are left hanging listening to a single keyboard note wondering what is coming. When the song kicks back in, you are treated to a fantastic section of mixed toned lyrics that build to an awesome riff and then a mixture of screeched lyrics being offset by that riff. There is a breakdown to a short slow melodic part with just gentle lyrics and keyboard that really shows off the vocal ranges. 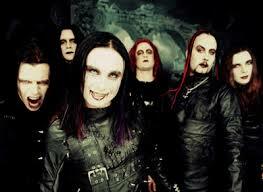 You will swear there are at least 5 different voices going on here but they are all Dani Filth. The song has a head bang inducing riff at the end to chants of the album’s title. Amazing! Beneath the Howling Stars is up next and is the third plus 7 minute song in a row. Another fast paced song which suffers a little from tinny drums but has a much improved bass sound. There are a multitude of riffs playing along with the vocals. Another slowdown after 3 minutes is followed by slower paced singing that builds to the female vocals. This eventually leads into a brilliant section of both Dani’s and the female vocals working together and it sounds amazing. The song builds then back up to the pace of the songs start along with a short guitar solo and increasing pace to the end. Like most Cradle songs you are left feeling like you have been on a journey which is exactly what you should feel on a concept album. The fifth track is called Venus in Fear and is another interlude and succeeds in creeping you out. It is 2 minutes and twenty seconds of Gothic keyboards and orchestral sounds with the sounds of an out of breath woman screaming in fear over the top of the ever building sounds. The screams get more persistent and louder throughout before an abrupt end. Very Cradle. Track 6 is back to the songs with the fastest track on the album, Desire in Violent Overture. At 4 minutes and 15 seconds long it is also the shortest. It is very guitar driven with less effects and keyboards than the songs that have come previous. The drums still sound a little off but the guitars lead through different sections brilliantly with Dani singing to match the different rhythms in each section. A short but still pacey female spoken word section leads back into Dani’s growls. The Twisted Nails of Faith is up next and is just under 7 minutes long. A creepy keyboard effect intro over different tones of female vocals eventually builds into another scream and thrashy guitar riff. The drums continue to sound like sauce pans being hit but it doesn’t detract too much from the song. Dani’s trademark screeches work at pace alongside a speedy guitar and drum beat throughout the early parts of the track with atmosphere held by backing effects. Another slowdown half way through brings in the deeper lyrics that leads into an absolutely awesome guitar lead which itself continues on but is joined by rhythmic singing. A slight effects breather before the pace picks up again, possibly even faster than before. This continues to the end over fading lyrics which are simply the songs title over and over again. It is amazing how much Cradle pack into a song without it becoming a mess. Track 8, Bathory Aria, is an epic monster of a song. It is actually three very different tracks put together into an 11 minute long beast. The first part, Benighted Like Usher, is a slow rhythmic affair with vocals that range between whispers, screeches and deep growls. The pace picks up a little near the end to lead into the second section, A Murder of Ravens in Fugue, which is deep and dark over a mechanical riff to start. Eventually the lead guitars take over though and keep the pace going but as this section comes to an end it all slows right down again to a more chant style vocals over lead guitars. The final section, Eyes that Witnessed Madness, starts from this chanting rhythm and pulls the pace back up for a verse before all instruments come to a stop for some keyboard effects, some screams and some really deep spoken word from Dani. A single drawn out riff joins in before Ingrid Pitt takes over for a truly creepy spoken ending that Dani assists in with the odd screech or growl through the end. This song is a complete story all on its own. After that breathless epic we have Portrait of a Dead Countess, another 2 minute and 40 second interlude which is just keyboards playing somber notes. The final track on the album also has the greatest title, Lustmord and Wargasm (The Lick of Carnivorous Winds). It is consistently fast and thrashy throughout after an orchestral build up that explodes like a storm into the song. The lead guitars are more prominent on this song in a good way. The different rhythms are matched by Dani lowering or raising the tone of his lyrics. The drums sound a little improved. The song carries on at a ferocious pace until near the end where there is a minute of more melodic guitar playing over slower, deeper vocals. This picks up again and plays through to the end where there is a short guitar solo and then back to pace to the close. This was the album that introduced me to Cradle and pulled me deeper into Black Metal. As a concept album, it is executed excellently. The mood, atmosphere and lyrical content do leave you feeling like you have experienced a little bit of mythology so in that it is a great success. Aside from that though it is creative, intelligent, shocking, written brilliantly and played expertly. My only complaint is the poor drum production. There isn’t enough oomph to them but it doesn’t detract from the album too much as there is so much else going on. I highly recommend this album. It is really very good and if it doesn’t interest you, it will at least creep out your girlfriend. Midian by Cradle of Filth was part of my permanent soundtrack when I was 15. Good review.